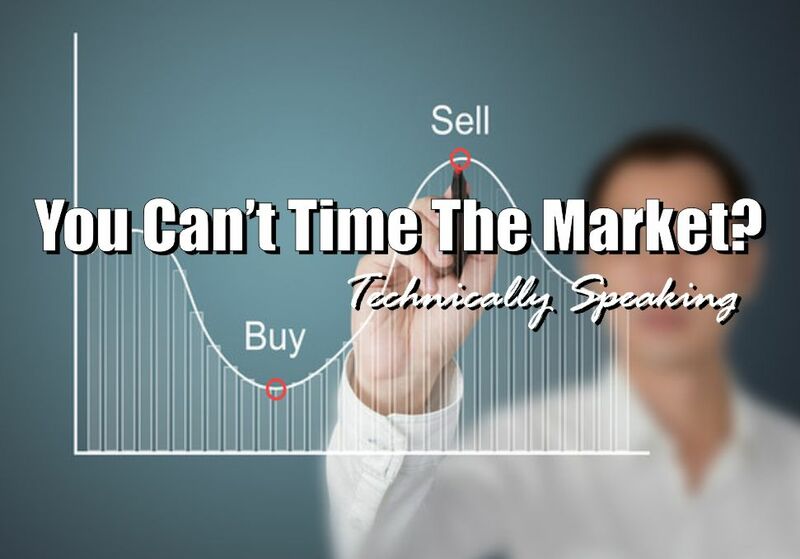 You Can’t Time The Market? Since the markets were closed on Monday, there really isn’t much to update from this past weekend’s newsletter. The markets remain clearly and undeniably overbought and the risk of a short-term correction outweighs the potential for reward. In the end, they will care about corrections and the “chase for yield” will end as badly as every other bubble throughout history. But I have written plenty about that in the past. It is the “you can’t time the market” part of the email that I want to address today. “They’ll cite studies showing that over the long-term investors made most of their money from just a handful of big one-day gains. In other words, if you miss those days, you’ll earn bupkis. And as no one can predict when those few, big jumps are going to occur, it’s best to stay fully invested at all times. So just give them your money… lie back, and think of the efficient market hypothesis. You’ll hear this in broker’s offices everywhere. And it sounds very compelling. 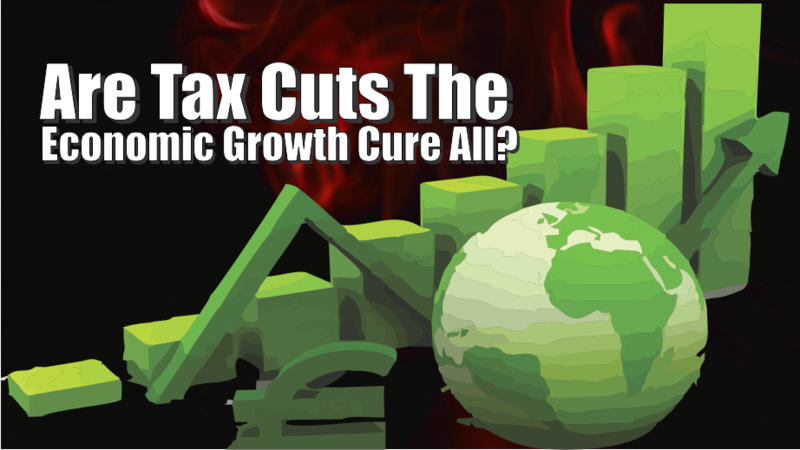 The best long-term study relating to this topic was conducted a few years ago by Javier Estrada, a finance professor at the IESE Business School at the University of Navarra in Spain. To find out how important those few “big days” are, he looked at nearly a century’s worth of day-to-day moves on Wall Street and 14 other stock markets around the world, from England to Japan to Australia. Yes, he found that if you missed the 10 best days you missed out on a lot of the gains. But he also found that if you managed to be out of the market on the 10 worst days, your profits went through the roof. “Over an investing period of about 40 years, he calculated, missing the 10 best days would have cost you about half your capital gains. But successfully avoiding the 10 worst days would have had an even bigger positive impact on your portfolio. Someone who avoided the 10 biggest slumps would have ended up with two and a half times the capital gains of someone who simply stayed in all the time. The reason that the finance industry doesn’t tell you the other half of the story is because it is NOT PROFITABLE for them. The finance industry makes money when you are invested – not when you are in cash. Therefore, it is of no benefit to Wall Street to advise you to move to cash. Now, let me clear. I do not strictly endorse “market timing” which is specifically being “all in” or “all out” of the market at any given time. The problem with market timing is consistency. You cannot, over the long term, effectively time the market. Being all in, or out, of the market will eventually put you on the wrong side of the ‘trade’ which will lead to a host of other problems. There are no great investors of our time that “buy and hold” investments. Even the great Warren Buffett occasionally sells investments. (He just recently sold almost his entire stake in Walmart.) True investors buy when they see value, and sell when value no longer exists. The chart below shows a simple moving average crossover study. The actual moving averages used are not important, but what is clear is that using a basic form of price movement analysis can provide a useful identification of periods when portfolio risk should be REDUCED. Importantly, I did not say risk should be eliminated; just reduced. 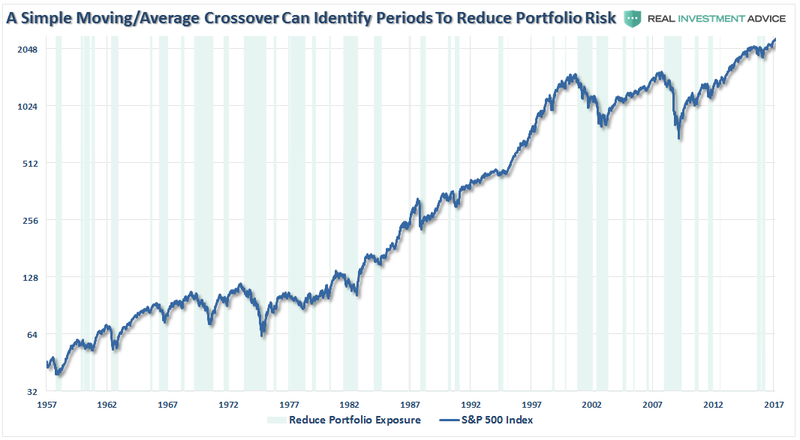 By using some measures, fundamental or technical, to reduce portfolio risk by taking profits as prices/valuations rise, or vice versa, the long-term results of avoiding periods of severe capital loss will outweigh missed short term gains. Small adjustments can have a significant impact over the long run. “First, let’s be clear what it doesn’t mean. It still doesn’t mean you should try to ‘time’ the market day to day. Mr. Estrada’s conclusion is that a small number of big days, in both directions, account for most of the stock market’s price performance. Trying to catch the 10 biggest jumps, or avoid the 10 big tumbles, is almost certainly a fool’s errand. Hardly anyone can do this sort of thing successfully. Even most professionals can’t. There is little point trying to catch twist and turn of the market. But that also doesn’t mean you simply have to be passive and let it wash all over you. It may not be possible to “time” the market, but it is possible to reach intelligent conclusions about whether the market offers good value for investors. Despite their inherent belief that they are long-term investors, they are consistently swept up in the short-term movements of the market. 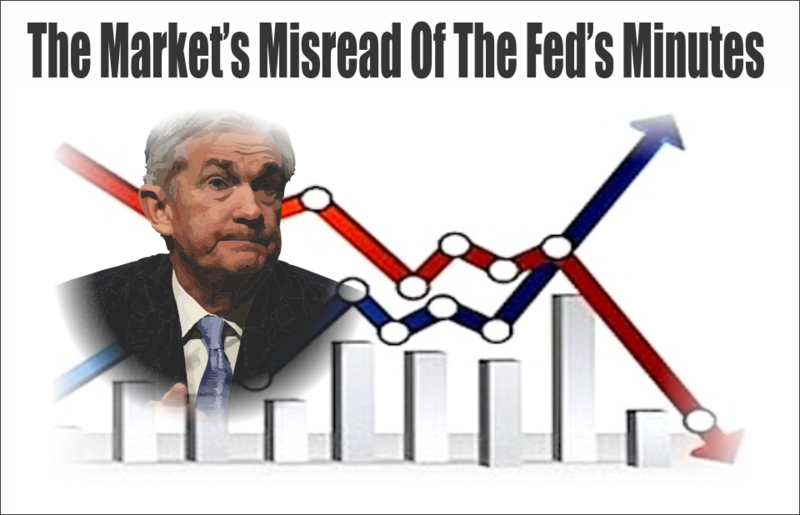 Of course, with the media and Wall Street pushing the “you are missing it” mantra as the market rises – who can really blame the average investor “panic” buying market tops and selling out at market bottoms. Yet, despite two major bear market declines, it never ceases to amaze me that investors still believe that somehow they can invest in a portfolio that will capture all of the upside of the market but will protect them from the losses. Despite being a totally unrealistic objective this “fantasy” leads to excessive risk taking in portfolios which ultimately leads to catastrophic losses. Aligning expectations with reality is the key to building a successful portfolio. Implementing a strong investment discipline, and applying risk management, is what leads to the achievement of those expectations.